The Supreme Person appears in innumerable forms to enjoy transcendental relationships. Some of His expansions are tiny, dependent beings, like us, and some are complete and omnipotent beings like Himself. 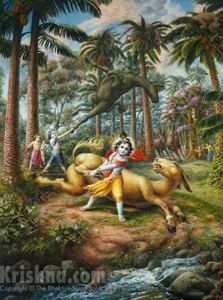 Balarama, or Baladeva, is Krishna's primary all-powerful expansion. When Krishna desires to appear in this world as an avatar, Balarama arranges for that appearance by expanding Himself into more forms of God. 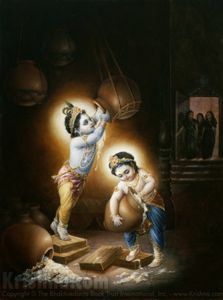 During Krishna's pastimes on earth, Balarama was present as His elder brother. The Srimad-Bhagavatam describes Their superhuman activities in the village of Vrindavan and the city of Dwaraka. 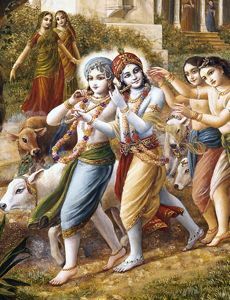 Krishna, the Supreme Person, expands Himself into many other forms of God in order to enjoy transcendental pastimes and to create and oversee the material world. Balarama is Krishna's first expansion, who often appears as Krishna's brother. Through Balarama come countless other avatars, forms of God. Here, Harinama Dasi narrates "The Glories of Lord Balarama"— the Introduction to Chaitanya Charitamrita, Adi Lila, Chapter 5. Click on that link to read along. You'll be glad you did. "Baladeva [Balarama]: He is the divine son of Vasudeva by his wife Rohini. He is also known as Rohini-nandana, the beloved son of Rohini. He was also entrusted to Nanda Maharaja along with His mother, Rohini, when Vasudeva embraced imprisonment by mutual agreement with Kamsa. So Nanda Maharaja is also the foster father of Baladeva along with Lord Krishna. 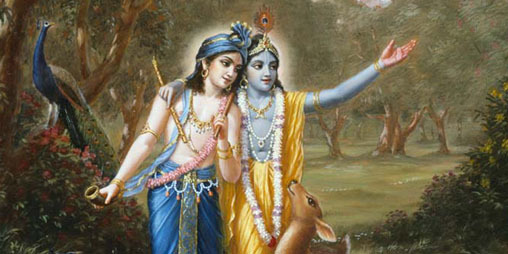 Lord Krishna and Lord Baladeva were constant companions from Their very childhood, although They were stepbrothers. He is the plenary manifestation of the Supreme Personality of Godhead, and therefore He is as good and powerful as Lord Krishna. He belongs to the vishnu-tattva (the principle of Godhead). He attended the svayamvara (selection of her bridegroom) ceremony of Draupadi along with Sri Krishna. When Subhadra was kidnapped by Arjuna by the organized plan of Sri Krishna, Baladeva was very angry with Arjuna and wanted to kill him at once. Sri Krishna, for the sake of His dear friend, fell at the feet of Lord Baladeva and implored Him not to be so angry. Sri Baladeva was thus satisfied. Similarly, He was once very angry with the Kauravas, and He wanted to throw their whole city into the depths of the Yamuna. But the Kauravas satisfied Him by surrendering unto His divine lotus feet. He was actually the seventh son of Devaki prior to the birth of Lord Krishna, but by the will of the Lord He was transferred to the womb of Rohini to escape the wrath of Kamsa. His other name is therefore Sankarsana, who is also the plenary portion of Sri Baladeva. Because He is as powerful as Lord Krishna and can bestow spiritual power to the devotees, He is therefore known as Baladeva. 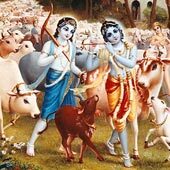 In the Vedas also it is enjoined that no one can know the Supreme Lord without being favored by Baladeva. Bala means spiritual strength, not physical. Some less intelligent persons interpret bala as the strength of the body. But no one can have spiritual realization by physical strength. Physical strength ends with the end of the physical body, but spiritual strength follows the spirit soul to the next transmigration, and therefore the strength obtained by Baladeva is never wasted. The strength is eternal, and thus Baladeva is the original spiritual master of all devotees. Sri Baladeva was also a class friend of Lord Sri Krishna as a student of Sandipani Muni. In His childhood He killed many asuras along with Sri Krishna, and specifically He killed the Dhenukasura at Talavana. During the Kurukshetra battle, He remained neutral, and He tried His best not to bring about the fight. He was in favor of Duryodhana, but still He remained neutral. When there was a club-fight between Duryodhana and Bhimasena, He was present on the spot. He was angry at Bhimasena when the latter struck Duryodhana on the thigh or below the belt, and He wanted to retaliate the unfair action. Lord Sri Krishna saved Bhima from His wrath. But He left the place at once, being disgusted at Bhimasena, and after His departure Duryodhana fell to the ground to meet his death. The funeral ceremony of Abhimanyu, the son of Arjuna, was performed by Him, as He was the maternal uncle. It was impossible to be performed by any one of the Pandavas, who were all overwhelmed with grief. At the last stage, He departed from this world by producing a great white snake from His mouth, and thus He was carried by Sesanaga in the shape of a serpent."